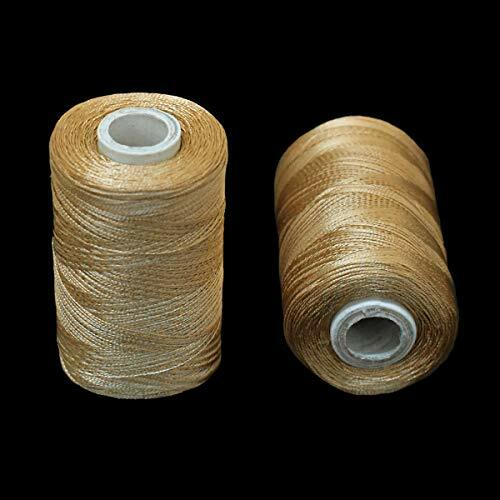 SuperB Embroidery polyester thread 5000m. New Brothread - EMBROIDER AND SEW YOUR LIFE! New Brothread is a very professional manufacturer and supplier for Polyester Embroidery Machine Threads with More than 28 years experiences Since 1988. After so many years development, we owned TOP high quality machines including Twisting machines with Italian technology and Winding machines with Germany technology to supply our Polyester Embroidery Machine Threads in high quality. 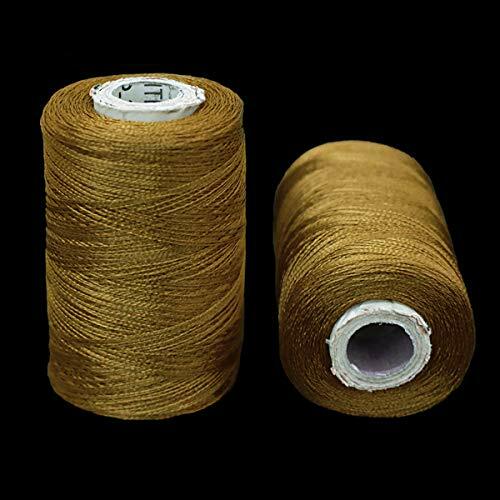 We are planning to supply all the embroidery supplies including bobbin threads, embroidery stabilizers, metallic threads, embroidery crafts, embroidery accessories..., which can satsify our clients in maximum to purchase all these embroidery supplies from New Brothread one-stop service. Our mission is to supply our embroidery supplies in Incredible Value, Unbeatable Price and Wonderful Customer Experience. You will get 100% Quality Guarantee + 100% Risk-Free Satisfaction Guarantee from us. 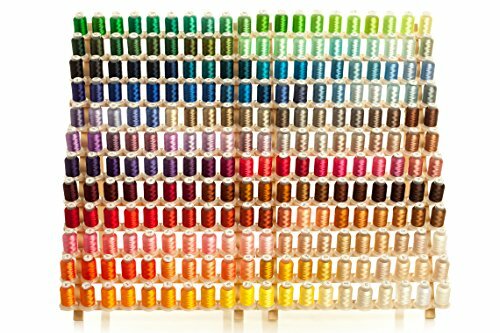 40 SPOOLS PER KIT + COLOR CHART - 40 spools great assorted bright and beautiful colors Polyester Embroidery Machine Thread to brighten and beautify all sort of your embroidery projects. Using Color Chart to find similar Brother Color No. and name, Conversion Chart of Madeira is also available. 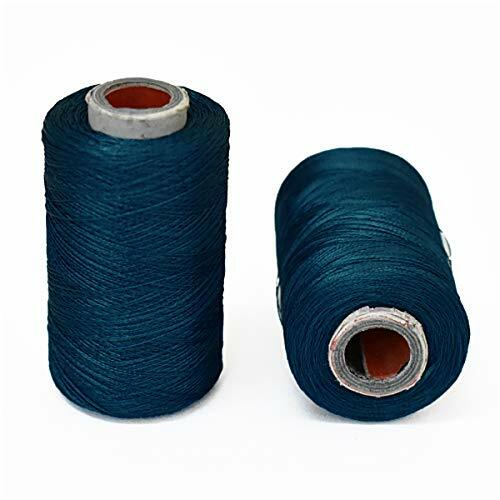 PERFECT WEIGHT & LENGTH - Each spool has 40 WT and 500M(550Y) length, which makes these spools of Polyester Embroidery Machine Thread ideal for all sort of your embroidery projects. 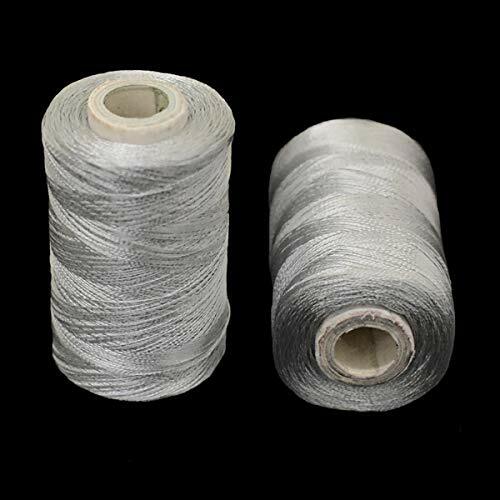 EXCELLENT TENSILE STRENGTH - Lower risks of breaking or fraying, Elasticity and Tenacity of polyester also reduces risks of looping and puckering of Polyester Embroidery Machine Thread. SUPER COLOR FASTNESS - Polyester Embroidery Machine Thread holds up colors even when subjected to commercial laundering, bleaching and other harsh chemicals, desirable features for workwears, uniforms and linens which are often subjected to commercial laundering. New Brothread Polyester Embroidery Machine Thread always think what you think, do what you do, love what you love. NOTE: This kit DOES NOT come with wood rack!!! MAKE SURE BUYING THROUGH New Brothread (Sold by) for original WARRANTY!!! COMPATIBITY - Suitable for even all kinds of home and commercial Polyester Embroidery Machine Thread serger machines, e.g, Brother, Babylock, Janome, Singer, Bernina and so many famous machines. Threads have no breakage, shredding or splitting. Not only is Simthread Thread beloved by embroiderers, it is also a hit among quilters. Bet you can not go wrong when you buy from us. GREAT VALUE Plus FREE BONUS - Available in 63 Brother Polyester Embroidery Machine Thread popular bright colors, 550Yards(500M) each spool. 63 different color collections meet both beginners and professionals. PLUS FREE PREWOUND BOOBIN THREAD and FREE TEAR AWAY STABILIZER. FREE conversion color chart also included. YOUR PROJECT IS IMPORTANT TO US - All Simthread Polyester Embroidery Machine Thread are exhaustively and Independently Third-Party Lab Tested. Certified Non-Toxic BPA-Safe, Lead-Safe and Phthalates-Safe. They also come with a 100 percent Money Back Guarantee. MAKE SURE BUYING THROUGH Simthread LLC (Sold by) Polyester Embroidery Machine Thread for original warranty. 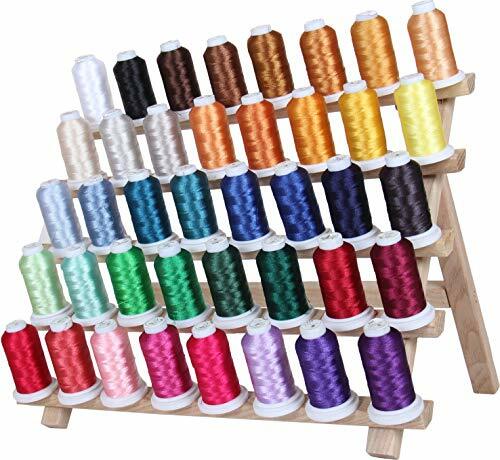 Are you looking for a set of embroidery thread spools that consists of all the beautiful colors that you might want to use in one of your projects, and which would also eliminate the need to rush to a neighbouring embroidery supply store at the last moment, just to find the right match? Do you want to use only high-strength threads with superior color-fastness in your embroidery projects such that they wouldn't shrink, bleed or loose their color over time, even when subjected to commercial laundering or bleaching? NOTE - Spool Rack not Included! ORDER NOW and Get this Incredible 40 Spool Set Delivered to you in Just 3-5 Days! 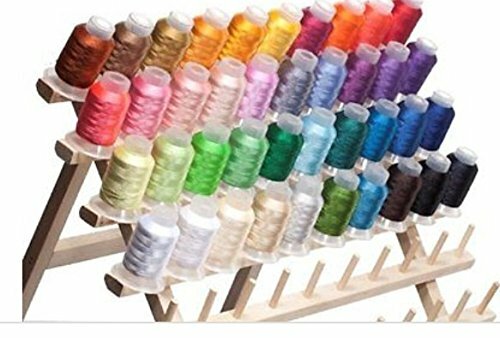 SET OF 40 SPOOLS - Embroidex brings to you a set of 40 Polyester Embroidery Thread Spools which come in beautiful colors to embellish and brighten up any of your projects. Colors' numbering is similar to Brother Embroidery Thread Colors, just to make sure thread matching is a little easier for you. Embroidex is known for its best-in-class and cost-effective Machine Embroidery Supplies and you bet you can't go wrong when you buy from us! 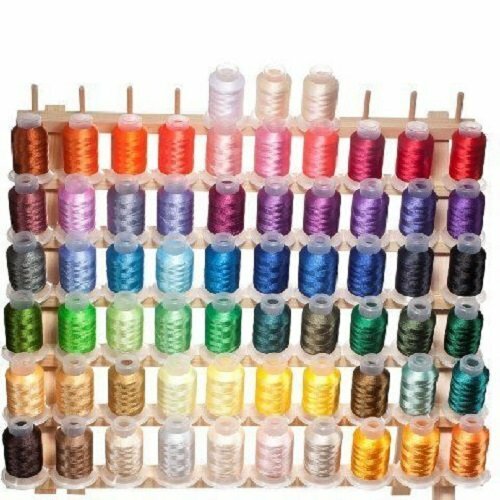 IDEAL WEIGHT & LENGTH - Each spool has 40 weight (most commonly used) and 500 meters (550 yards) long polyester machine embroidery thread which makes these spools ideal for all sorts of embroidery projects - The threads are ideal for Brother, Babylock, Janome, Singer, Pfaff, Husqvarna and Bernina Machines. HIGH STRENGTH - Our embroidery machine thread has excellent tensile strength which brings down chances of any breaking or fraying - fewer thread breaks allow you to complete your projects more efficiently and in a frustration-free manner. Long elongation of polyester also helps eliminate the chances of looping and puckering. These characteristics which impart high durability to the thread become extremely important when your clothing is expected to go through commercial laundering! COLOR FAST - Not only strength is important but even the color fastness of the thread when it comes to laundering, chlorine bleach or for that matter use of any harsh chemicals. Polyester is known for its ability to hold its colors really well when compared to other threads like rayon and is, therefore, a preferred choice of many as it doesn't easily shrink or bleed. This spool set for sure makes for an essential embroidery supply! 100% RISK-FREE SATISFACTION - We also offer you 100% Risk-Free satisfaction to let you buy with confidence; no questions asked. 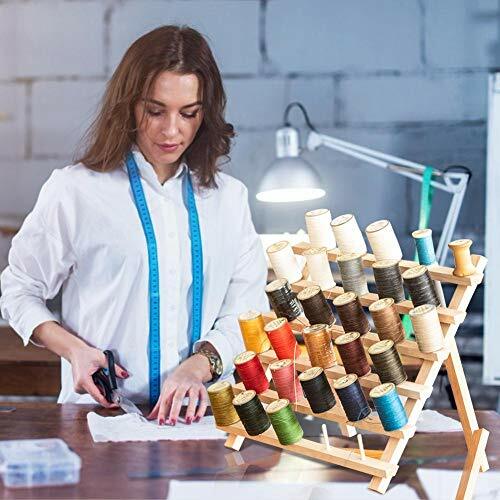 However, we are quite sure that you will be super-impressed with the full spectrum of bright and beautiful colors that you get in this 40-spool set, the sufficiently long length of the threads, and their weight which makes them useful for a wide range of projects.Thread Spool rack NOT INCLUDED! 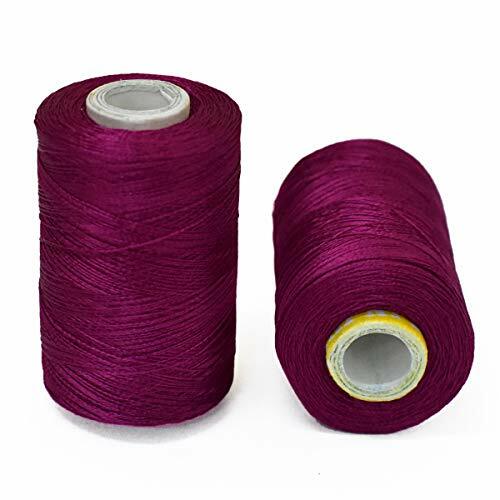 This high sheen polyester thread for machine embroidery has outstanding tensile strength and color-fastness. Polyester thread offers outstanding performance for today's sophisticated computerized sewing machines. 1000m mini-king cones (1100yds) 100% Polyester. 40 wt. 220 Colors available by the spool. Pick your own colors. Strong, embroiders beautiful. Comes with a 30 day no questions asked money back gaurantee. 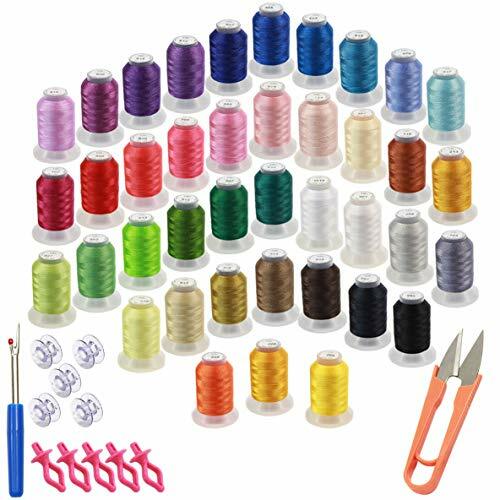 63 SPOOLS PER KIT + COLOR CHART - 63 spools professional assorted bright and beautiful colors Polyester Embroidery Machine Thread to brighten and beautify all sort of your embroidery projects. Using Color Chart to find similar Brother Color No. and name, Conversion Chart of Madeira is also available. Hardwood 120 spool thread rack for mini king Cones & Spools. Best Thread Organizer in the market. Made from Hardwood and very sturdy. 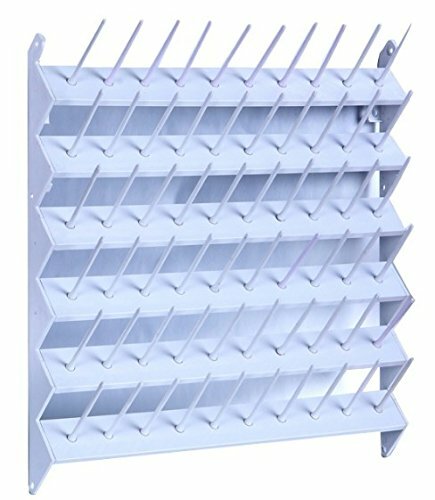 The thread rack can be free standing or easily mounted on the wall. The hooks for hanging the thread rack on the wall are already attached to the rack. You just need 2 nails on your wall to hang this thread rack. The rack can be painted or stained to match your Embroidery or Sewing machine or the paint in your sewing room. Size of Rack is 15 x 24. The rack fits Mini King Cones only. Will NOT fit Robison-Anton cones or cones with larger base. Is your sewing room not as tidy as you'd like it to be? Wondering where and how do you begin to organize the mess? Are you having problems finding what you were looking for among the loads of thread spools? Well, do not fear, we bring to you our thread organizer rack to help you start organizing your sewing room Thread is the first link to sewing and taking care of them is very important. Here are a few reasons why every crafts person needs this thread organizer rack - Our Embroidex thread organizer rack will change your thread storage system Holds upto 60 thread spools and almost of any size The extra tall 3 inch spool pins are removable to accommodate even King size spools The tall pins also allow for stacking duplicate spools It is easy to stack because of its shape and unique design Helps you keep each spool supported and separated Protects your threads from tangles, loose, saggy on the spools You can hang this rack right over your work space for easy access Wall mountable and with white finish, it will fit into any decor The rack is made up of super quality Plastic which is more durable Creates plenty of space for new threads and keeps your space organized What are you waiting for? Buy Now! 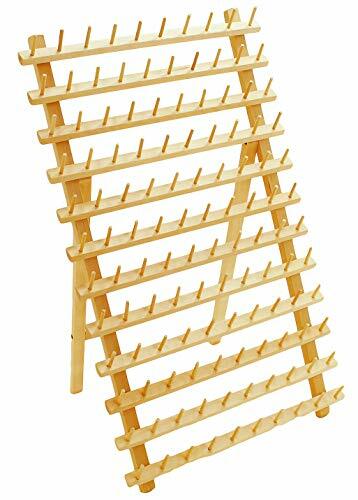 The Embroidex 60 Thread Organizer Rack and find your threads just when you need them. We also offer you 100% RISK-FREE SATISFACTION GUARANTEE! So, why think twice? Order now and get this useful and convenient product delivered to your door step in just 5-6 Days. PROFESSIONAL THREAD ORGANIZER - An unorganised sewing thread stash could pretty quickly become a mess and might make finding the right spool or keeping up with the inventories a frustrating/annoying experience. 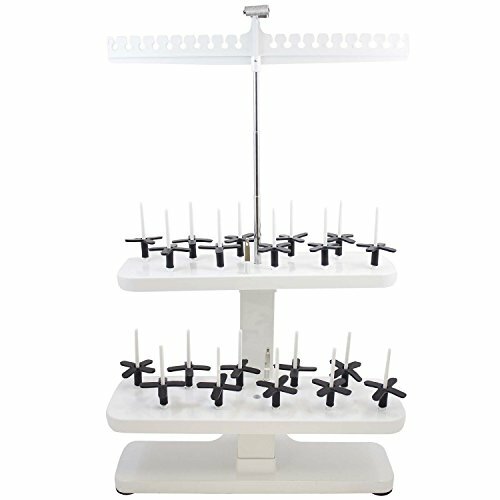 Embroidex Thread Organizer rack is an extremely effective thread storage system which not only helps in easy Organization of thread spools but also helps accessing the right ones a lot easier - no searching around or digging through drawers for the matching threads. EASY TO STACK - This is definitely the thread organizer rack you need to have in your craft space. The rack can hold upto 60 spools and that too of almost any sizes. The pins are removable and can accommodate extra large spools as well. The long pins allow stacking duplicate thread spools together and thus give better idea of inventory - helps avoid overstocking and duplicating. Moreover, it is extremely easy to stack spools because of its shape and unique design. TANGLE-FREE PROTECTED THREADS - Tossing spools in a box, drawer or bin will only lead to tangles when rummaging for a specific color as the spools will inevitably unravel, or else will result in loose, saggy spots on the spools. Have you ever picked a spool only to discover that it breaks apart as you start to work with it? Using our thread organizer rack can prevent this by letting you keep each spool well supported and separated from the other one! 100% RISK-FREE SATISFACTION GUARANTEE - We offer you 100% risk-free satisfaction guarantee to let you buy with confidence; no questions asked. We also highly recommend not to store your thread loose in any bag, pouch, container, or drawer but organize your crafting essentials in a Creative way with our Thread Organizer rack, and Enjoy sewing without any tangles because Thread is what holds it all together! Embroidex - 20 Spool Thread Stand for All Home Embroidery Machines Brother Babylock Janome Bernina Pfaff etc. 1. Saves time during thread changes 2. Organize thread by sequence for an embroidery design. No more confusion about which color thread is next. 3. Controls unwieldy horizontal spools 4. Cuts thread tails with a gentle swipe 5. Includes a specialty thread guide, king spool stabilizers, thread retainer and four horizontal spool pins Easy to Use Simply select the thread, feed it through the guide and thread your machine. The Thread Pilot handles all types of threads, decorative yarns and narrow flat ribbons. The Embroidex 20 Thread Stand makes it easy to stay organized at your machine. Simply load your favorite 20 thread colors, in any put-up, and you'll be ready for take-off. We are confident you'll become so organized and efficient that you'll need extra thread! This amazing thread organizer neatly accommodates King Cones, mini-king, snap spools, wound and cross-wound sewing spools. 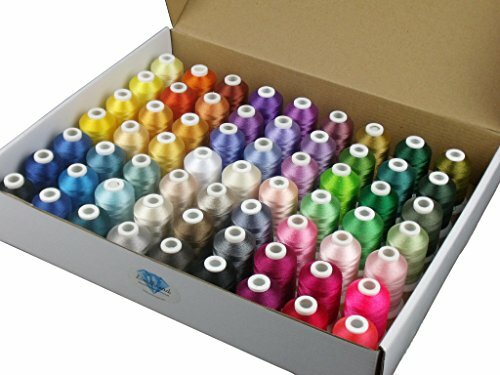 12 SPOOLS PER KIT - 12 spools Top-Sell and Most Popular variegated colors Polyester Embroidery Machine Thread to brighten and beautify all sort of your embroidery projects. Make your embroidery unique and highlighted from single color projects!!! 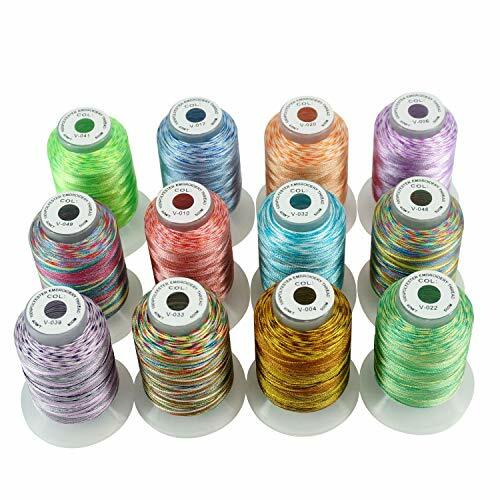 PERFECT WEIGHT & LENGTH - Each spool is 120D/2 (40WT) and 500M (550Y) length, which makes these spools of variegated colors Polyester Embroidery Machine Thread ideal for all sort of your embroidery projects. New Brothread Polyester Embroidery Machine Thread always think what you think, do what you do, love what you love. Set of 40 spools of 500 meter (550 yards) of machine embroidery polyester thread, Starter Set A - Vibrant Colors. This style of spools will fit in all major embroidery/sewing. Brother, Pfaff, Babylock, Melco, Bernina, Singer, Husqvarna and More. The thread is 40 weight, the standard for machine embroidery. Our thread is designed for high speed home and commercial embroidery machines. It has outstanding shine, tensile strength and color-fastness. Excellent tensile strength minimizes thread breaks and fraying. A white snap-style thread holder is include on each mini-king cone. It holds the end of the thread in place during storage to prevent unraveling and tangles. We offer a total of four different 40 cone polyester thread sets on 500 meter spools. You can collect all four sets (A,B,C,D) for a total of 160 different colors of machine embroidery thread. Set A - Starter Set of our 40 Most Popular/Basic Colors. New to machine embroidery? This is the set you will want to purchase first and includes black and white. Jewel - Set B - We call this extension set our Jewel tone set and as the name suggests it features a wide range of gem colors including both deep, rich tones and pastel colors. Vivid - Set C - This extension set called our Vivid set will really extend your range of pink/red and green shades of thread. A good set to add for holiday and nature embroidery work. Brilliant - Set D - This extension set called our Brilliant set will increase your selection of blues and neutral colors of thread. Sometimes we forget to collect the neutral shades of thread because they are not the pretty ones. Add this set to your thread collection and you will have the colors you need on hand. Plus, this set is not all boring. It has some really pretty blues to enjoy. Thread spool rack is used for display purposes only and is not included with purchase. The thread does, however, come in a giftable box and each spool is individually shrink wrapped and labeled. 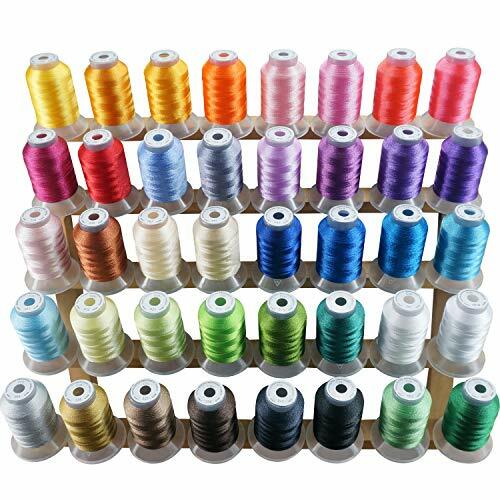 A set of 40 spools of 500 meter (550 yards) of machine embroidery polyester thread in beautiful colors. This style of spools will fit in all major embroidery/sewing. Brother, Pfaff, Babylock, Melco, Bernina, Singer, Husqvarna and More. Set A - Starter Set of our 40 Most Popular/Basic Colors. New to machine embroidery? This is the set you will want to purchase first. 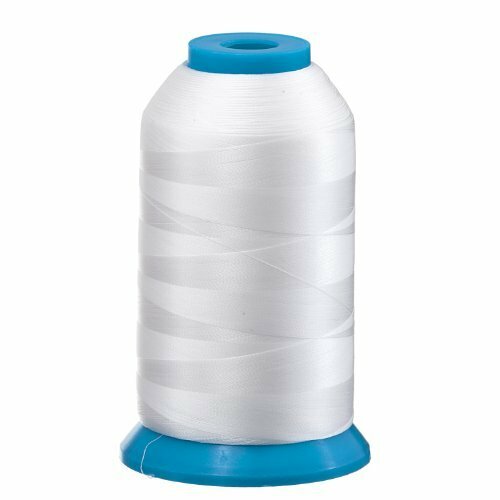 This thread is 40 weight, the standard for machine embroidery. 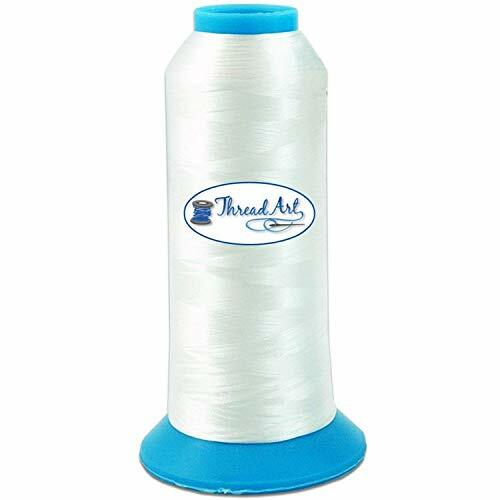 Our thread is designed for high speed home and commercial embroidery machines. It has outstanding shine, tensile strength and color-fastness. Excellent tensile strength minimizes thread breaks and fraying. A white snap-style thread holder is include on each mini-king cone. It holds the end of the thread in place during storage to prevent unraveling and tangles. 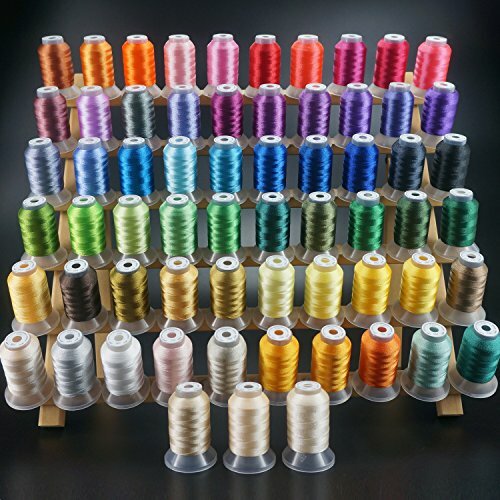 We offer a total of four different 40 cone polyester thread sets on 500 meter spools. You can collect all four sets (A,B,C,D) for a total of 160 different colors of machine embroidery thread. Set A - Vibrant Starter Set of our 40 Most Popular/Basic Colors. Jewel - Set B features a range of gem colors with deep, rich tones and pastel colors. Vivid - Set C - has range of pink/red and green shades of thread. Brilliant - Set D - has a selection of blues and neutral colors of thread. Thread spool rack is used for display purposes only and is not included with purchase. The thread does, however, come in a giftable box and each spool is individually shrink wrapped and labeled. Simthread Polyester Embroidery Machine Thread always think what you think, do what you do, love what you love. NOTE: This kit DOES NOT come with wood rack!!! 1.Made of high quality natural beech wood, used for holding sewing, quilting, embroidery spools and most of the mini-cone 60-axis axis frame, natural authentic wood color, you can freely DIY, give them the one you like colour. 2. The spindle holds a variety of spools or cone sizes to store all your lines, convenient flipping legs can be placed on the table or suspended on the wall. Scope of application: home living room, etc. Product size (Approx. ): 30-axis: 40*32cm/15.75*12.60in. ; 12-axis: 16*12.5cm/6.30*4.92in. Assembly instructions: For the convenience of delivery, the assembly of the wooden stick has not been completed, please receive this product hou, assemble the wooden stick, you can use. Made of high quality natural beech wood, used for holding sewing, quilting, embroidery spools and most of the mini-cone 60-axis axis frame, natural authentic wood color, you can freely DIY, give them the one you like colour. The spindle holds a variety of spools or cone sizes to store all your lines, convenient flipping legs can be placed on the table or suspended on the wall. Product size (Approx. ): 30-axis: 40*32cm/15.75*12.60in. ; 12-axis: 16*12.5cm/6.30*4.92in. Scope of application: home living room, etc. Quality Service 24-hour online service, if you find any problem, please feel free to contact us.and our service team provide the best solution for you. KEAYOO 40WT is a high quality polyester machine embroidery thread. It has many advantages such as brilliance colour, good colour fastness, smooth and durable. Our embroidery thread is suitable for all DIY works, embroidery, hand sewing and embroidery machine. Brilliance colour makes your handicraft more interesting nad you life more colourful. Technical parameter: Colour: 40 different colours Length: 500 meters per coil Strength: 40 WT Material: Polyeter Applicable for: Brother / Babzlock / Janome /Singer/ Kenmore sewing and embroidery machine Speed of embroidery machine: 600-800 SPM; Size of embroidery needle: NM 75-90. IMMACULATE WEIGHT & LENGTH 40 spools have 40 WT and each 500M(550Y) length, which makes these spools of Polyester Machine Embroidery Thread ideal for all sort of your embroidery projects. COMPATIBITY : Suitable for even all kinds of home and commercial Polyester Embroidery Machine Thread serger machines, e.g, Brother, Babylock, Janome, Singer, Bernina and so many famous machines. Threads have no breakage, shredding or splitting. Not only is Simthread Thread beloved by embroiderers, it is also a hit among quilters. SUPER COLOR FASTNESS : Polyester Embroidery Machine Thread holds up colors even when subjected to commercial laundering, bleaching and other harsh chemicals. GREAT SEWING GIFTS : Keayoo Excellent Thread Produces Beautiful Embroidery! These threads are extremely versatile and beautiful. What makes them handy is their use in both machine embroidery and hand embroidery work. They are prominently used for decorating dresses, paintings etc.